What´s in the name has a ‘Big Burger’ to do with this all-in canoe trail? Everything! This All-In canoe trail is namely a delight for all your senses. The silent and scenic setting is just 30 km north from Västerås city and makes a perfect place for canoeing along the meandering Svartån River, especially during spring, summer and fall. 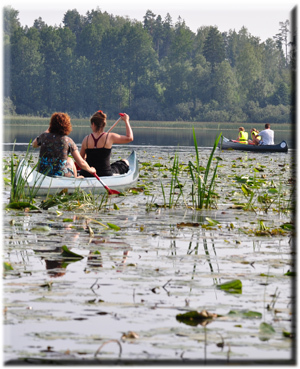 This All-In Canoe trail along the meandering Svartån River is ‘Natures Best‘ quality labelled! You arrive at Edens Garden Bed & Breakfast at about 9:30 am where you will be welcomed by your hosts John and Mandy, who will tell you all about the trail. It is then time to start paddling down the river to lake Fläcksjön and the island of Braheholmen where you should take a look at the beautiful pavilion that was built in 1807. This is the perfect place to eat your packed lunch and enjoy the spectacular view of the lake. As you slowly paddle back you will have the chance to appreciate the fantastic birdlife, the silence, the light and the nature. When you go ashore at the jetty, an campfire and evening meal will be waiting for you, all in genuine rural style. Gather round the campfire and grill the delicious locally ecologic produced Big Burgers and sausages. We want this to be an unforgettable experience for all your senses! 1495,- kr p/p incl. VAT. (min. 2 – max. 12 persons). Children under the age of 14 costs 795,- kr p/p. Parking with Edens Garden. Transport to the canoe ramp. The canoe and paddles, life jackets, map of the canoe trail, waterproof storage, and sheepskin rug to sit on. Lunch, fruit, drinks and BBQ (locally- and ecological produced meat, sauce, (goat)chees, warm bread, salad and coffee/tea). Ecological responsible wooden plates and cutlery. Fläckebo- Hällsjö: approx. 10 km (for families with young children). Rain jacket, sandals or boots, binoculars, photo camera, swimming gear, dry clothes. Massage 30 min. back and shoulders 300,- kr.